It was a steep cliff that faced the sea. A dangerous one at that. Rocks could fall anytime on me ship sinking us near these treacherous coasts. It was also dark but the prize on top was too good to be passed up. Me, Firsty and the Quartermaster scaled hard on the cliff. We were no mountaineers but we had faced tougher situations than climbing an ol' steep cliff. With great effort we reached the top. It was dark there too. Was our prize just a myth? Not determined to give up, I took out me looking glass and scanned the land around the cliff. I spotted a small light somewhere and said, "Lads, I see something in the distance." Me men chuckled for some reason and firsty tapped my back, "You are holding the glass the wrong way mate." Embarrassed, I removed the glass and saw into the direction of the light without the glass. Of course, it was closer than what the reversed glass had shown me. Our destination stood just about a mile away. "Could it be? ", I asked. The quartermaster nodded, "What else would it be?" We smiled as we proceeded on our march to the world renowned restaurant - Hakkasan. The food from the misty lands of Huaxia has enamored countless tribes of other lands for many a millennia. 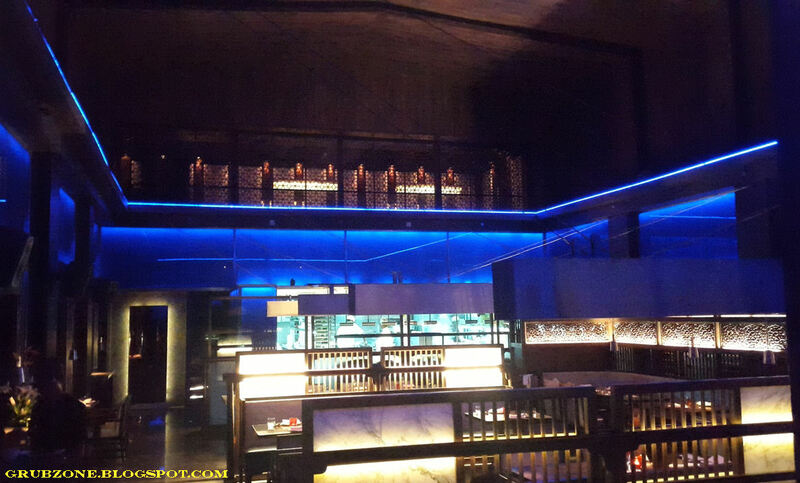 Hakkasan focuses mostly on the Cantonese aspects of this diverse food culture and is renowned world over for the same. While the Mumbai Hakkasan may or may not be on par with its Michelin-ed siblings in the West, it certainly provides a memorable experience in food, drinks and the whole package. 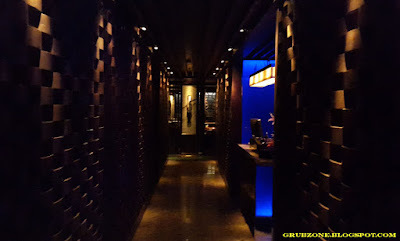 I walked down these passages being part of a motley group invited by the restaurant to sample their Golden week set. The Golden week is a week long of Holidays(with paid leaves for Office folks) for the Chinese people. Hakkasan brings the celebration to India with a special Golden themed menu which would intrigue lovers of Chinese food and culture. Beginning September 28, this short event brings the Golden Week set which is priced at INR 2250 per person. The set has a few exclusive items including the Golden Ice tea and Golden Macarons. 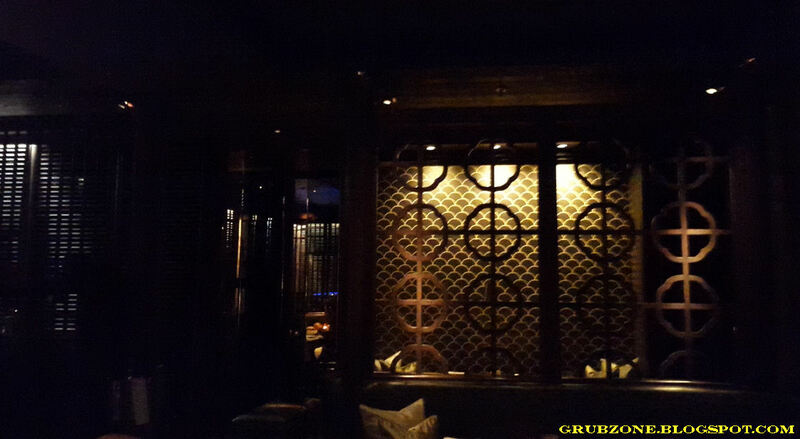 Hakkasan has a dim lit ambiance with a decor that imparts a feeling of regal proportions. 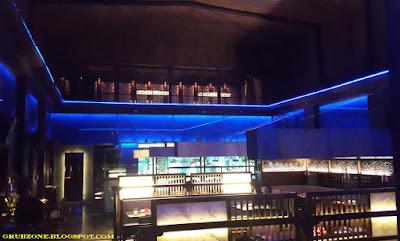 Though Hakkasan definitely has the feeling of the fine dine that it truly is, the lighting and wall work somehow makes it resemble a party lounge. The place is divided into two regions. The smaller area feels more classy and definitely is for the quiet sophisticated diner. The other area with its blue lighting feels custom made for a younger and louder audience. Without further delay the servers start bringing in the drinks. The Golden Ice tea is a product of Hakkasan's renowned mixology. 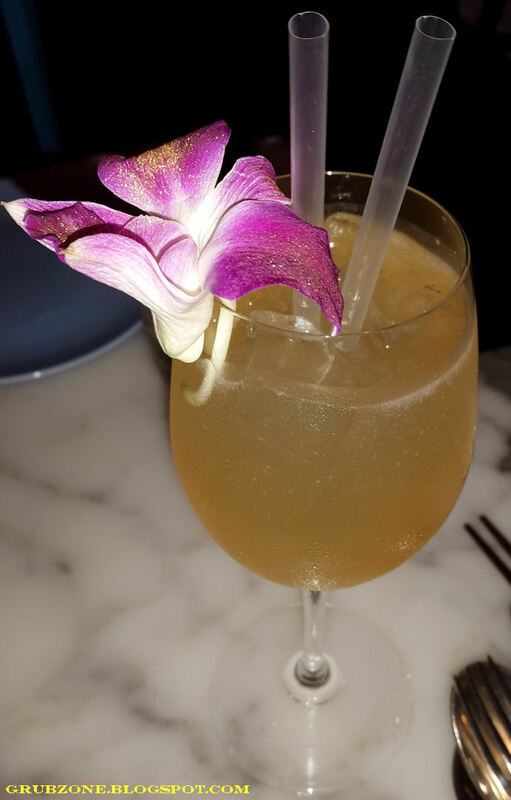 Having a golden appearance and decorated with an orchid, this drink jump starts the Golden week experience. Made with Orchid tea syrup, a bit of vodka, a lot of gin, some rum, white wine and peach bitters - This is a powerful cocktail. For a light drinker like me, this momentarily dazzled my senses with the Golden ambiance. This drink is an exclusive part of the Golden Week and patrons are unlikely to find it after the end of the event. The Prawns and Scallops Soup was a clear soup with Prawns, scallop bits, cherry tomatoes and greens. Was a mild soup and I was all right with it. 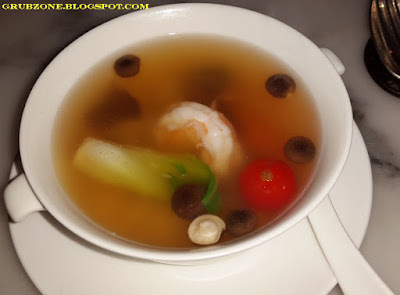 Though being the one who prefers slightly denser soups, I would say that it wasn't my favourite course. We were served with two platters of Dimsums. 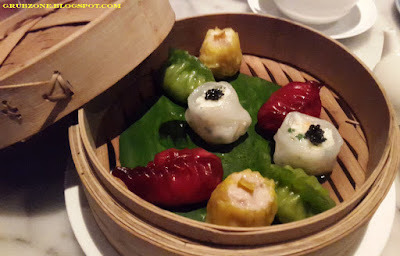 The carnivores platter had dimsums of smoked chicken and prawn(Ocher), Crabmeat(Red), Blackpepper seabass (White) and Steamed Lobster(Green). I found the crabmeat variant to be full of lip smacking umami and savory. The other variants paled a bit in comparison. The Green only versions were remarkably good as compared to the carnivore platter. These included the sticky rice shumai(best of the lot), Vegetable black pepper dumpling,Vegetable crystal dumpling and the Vegetable spicy dumpling. The appearance was on a similar color tone to the first platter. These were slightly saltier and spicier as well. Captain : All right Lads how do we go about splittin tis. Quartermaster : Oye Oye, don't be greedy. First mate :(laughs) Shame the Captain didn't quite agree with that sentiment. Quartermaster : What do you mean....Hey Captain, mate leave some for us. 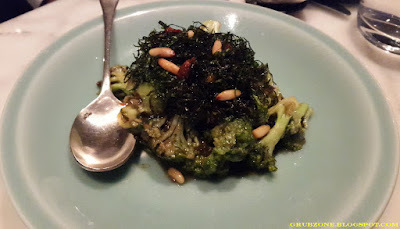 Crispy Brocolli with Sea Weed and pine nuts was a stir fried dish full of flavors. A bit of savory, some sweetness and umami. 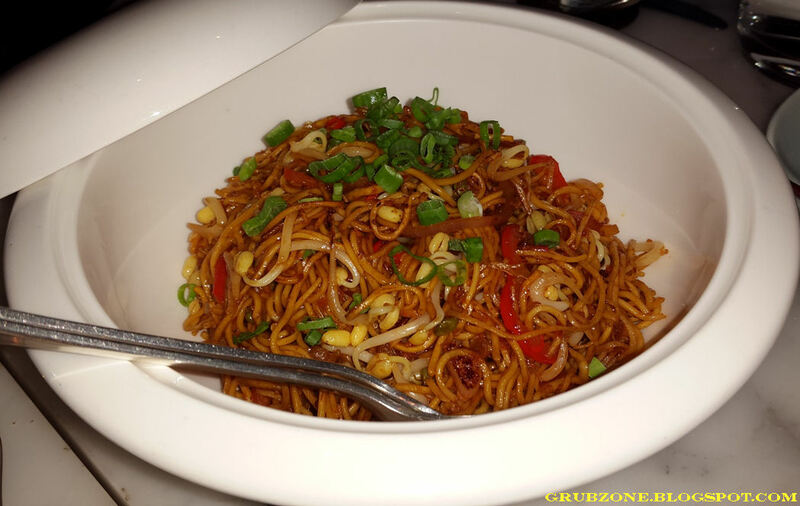 A truly Asian dish which even a vegetarian could relish. It paired really well with the Golden Ice tea. 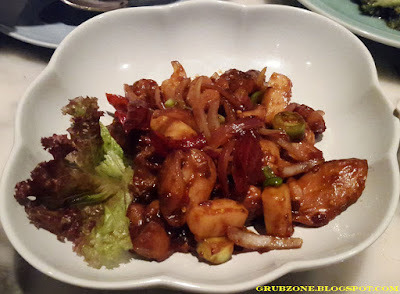 Stir Fry Chicken with Fragrant Chili sauce was part of the mains and epitomized fine Asian dining. The juicy chicken morsels oozed flavor with every bite. The sweet chili sauce gave a glimpse of the divine to the naive palate and the greens added sensible balance to the dish. With the Golden Ice tea, under the golden lights, this was an experience truly memorable. 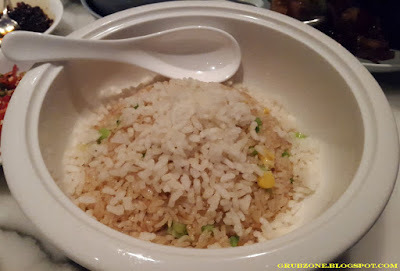 The Ginger rice was a medley of sensations I had not felt before. The sparing addition of corn and edamame concerted well with the dish and its appeal. It was great on its own and tasted quite well with the chicken as well. It seemed to fit in well with the Golden themes. The Stir fried Spicy Ramen was among my favorites in the set as I found myself gobbling seconds and thirds of it. The dish looked very colorful and seemed to define the very essence of the word foodporn. The spiciness was mild as per Indian palates and the ramen was surprisingly good for being completely vegetarian. 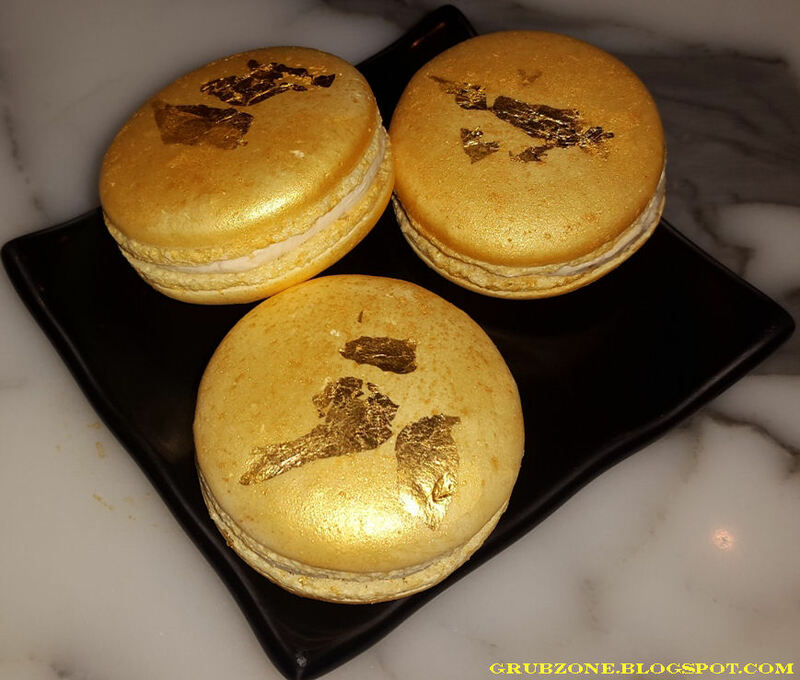 The meal ended with Golden Macarons. Like Gold doubloons to a pirate or Wonka's Golden Tickets to a kid, these tantalized my taste buds like nothing else. The visuals were absolutely enchanting with the Golden glitter. These shone like coins. The aroma was sweet and heavenly. A bite into these deep honeycomb infused Macarons was the perfect climax of the entire meal and the experience. Honey flooded my mouth as I chewed into these macarons. The sweetness was perfect and the flavor was beyond amazing. There are macarons and there are macrons but none come close to Hakkasan's Golden macarons. I would be so happy if they open a patisserie and sell these there. Captain : These edible doubloons are heavenly. This is all a great fantasy. First Mate : High on Dessert? That's something I didn't know can happen. Quartermaster : You have no idea. This means he positively enjoyed the desserts. The pricing is definitely on the higher side but then this experience certifies itself as one of a kind. The service was done with military precision, typical of a Michelin starred chain. There was no pretentiousness, no dramatics, no fancy clothing - just plain good service. Just that the staff could be a wee bit uninformed on the composition of the goods. This concluded my first journey to Hakkasan. I got a tiny bit of their expansive food universe. And it was quite an experience but I do feel that more journeys in the future are warranted to try more of their fine grub. You know explore more of that food universe. Try out the Hakkasan's Golden week fare from September 28 to October 18. "Smuggle those macarons well lads. We would have quite a banquet on the ship for a few days. Now back to climbing down that cliff and onto the open seas." The look and feel of that restaurant looks nice, but how is the noise level of the diners? Spices & Flavours - Fort, Mumbai.